TONTO LOOKS BACK ON 10 YEARS OF "TONTO-COMICS"
Tonto as a music plattform is even an ounce older. 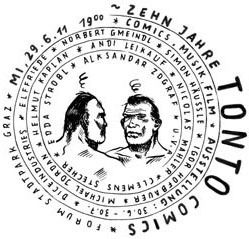 "Genossen" together with Helmut Kaplan was the first number of the publication series "Tonto-Comics". Today having arrived at number 13 "Noise" the series presents the backbone, the illustration of the development. In the beginning some years of involvement with experiments concerning community formation and basis rationing. The duo soon grows into a group, which becomes part of a widespread network of groups all over Europe, each of whom have chosen the medium comic as their space of examination. Tontos border location (Graz) within the German speaking area represents at the same time its proximity to Europe. Berlin is far as is Belgrade. The groups include for example Komikaze (HR), Le Dernier Cri (FR), Electrocomics (DE), Canicola (IT), Stripburger (SLO), Turbo-Comix (FR/RS), Kush! 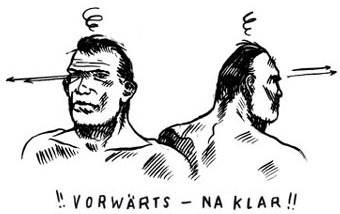 (LT), Kuti und Glömp (FI). The publications are released in the respective national language with an English translation as Lingua Franca. Displayed on two large desk landscapes Edda Strobl and Helmut Kaplan tell a story about TONTO comics from their particular point of view. Lines of developement, cessation arabesques, paths and dead ends - continuity. Additionally: Conterminuous to Tonto comics publications from all over Europe. a lot of the artist are present, Thomas Wolkinger tells us about his vision of Tonto comics and talks to Gordana Basta and Aleksander Zograf about works of embroidery based on comic jams. Mahlers "Mystery Music" (animation film) meets the mysterious song repertoire of "8 oder 9" (concert, fix cast Curd Duca/Norbert Gmeindl/Werner Jurasrek). DICINDUSTRIES from Hamburg deconstruct (concert). Reading by Michael Jordan (text and sketch) and Robert Lepernik (sound), who will subsequently cumb through the 30 Tonto Cds as "Tonto DJ". On show there will be: the status quo of the publication as a continuous sequence mounted on the walls of the exhibition space, original drawings of this work and further relevant materials. Once the girls had driven by night into the snow-covered mountains in order to prove with their urine marks that nature is able to produce the color of yellow in all of the seasons. Shortly after that the two friends left Europe and ended up in Central America. The year is 1991. The Eastern bloc is on the point of desintegration, the supposed "end of history" was just not yet reached. A war starts in Iraq - the first war transmitted live in television. One's own music is stored on audio tapes. A notion of "nomadology", an aimless desire is the romantic guiding star of the girls. They want to leave a trace, they get lost. Driftwood, ice floes, drug excesses. Of falling old gods and feverish dreams of young indians. Naked girls dance in the living room, a boy stares into a lake. Finally the journey freezes in Atlanta, USA, in a deserted apartment, in the freezer compartment of an icebox. Matìas Duville (AR), Norbert Gmeindl (AT), Franz Gruber (AT), Simon Häußle (AT), Michael Jordan (DE), Helmut Kaplan (AT), Michaela Konrad (AT), Andreas Leikauf (AT), Nicolas Mahler (AT), Bernhard Raschl (AT/GT), Edda Strobl (AT), Aleksandar Zograf (SRB) / Alootook Ipelie (CAN). Exhibition duration: Sat, February 6 - Sun, February 28. Artist's seminar: Sat, February 6 - Sat, February 13. With: Sami Aho, Jan Anderzén, Benjamin Bergman, Roope Eronen, Jyrki Heikkinen, Reijo Kärkkäinen, Jarno Latva-Nikkola, Hanneriina Moisseinen, Tommi Musturi, Pauliina Mäkelä, Aapo Rapi, Anna Sailamaa, Katri Sipiläinen, Janne Tervamäki, Amanda Vähämäki, Duuserit, Piirustuskerho, Amon Düde, Fricara Pacchu, Kiiskinen, Nuslux. "Glömp is an annual Finnish comics anthology released since year 1997. The publication started as a photocopied small fanzine that got bigger issue by issue. Intented to be a forum for new Finnish artists the publication later turned into an annual international book. 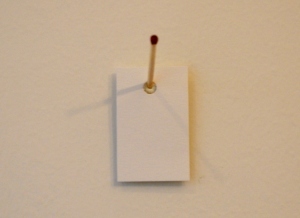 Glömp is edited, designed and published by Tommi Musturi, who also contributes in the anthology as an artist. The publication does not believe in being thematical wholesome but tries to find coherence from inside the group of contributors, their relativies and attitude towards life. Intention is to make honest, good and timeless releases. The editorial encourages artists for experiments. Often described being 'poetic comics', Glömp tries to stretch the limits of comic form, to be free platform for the artists invited along." It has been expanded to a new level of dimension on occasion of its tenth and last edition: a three-dimensional comic. For GlömpX 15 Finnish artists were invited to think their stories in three-dimensional installations. Invented and organised by Komikss Magzine Kush! in 2009 (Ed. a.o. David Schilter) in cooperation with the Latvian Centre for Contemporary Art. The exhibition was already on show in Riga/Latvia, will be shown in January 2010 in Lisboa/Portugal and will be on show, from February 26, at the NextComic festival 2010 in Linz/Austria.